Based on function, fat & water absorption is projected to reflect the highest CAGR in the market through 2026. However, nutrients and emulsifiers will account for relatively larger revenue shares of the market during the forecast period. In contrast, texturants will account for the smallest revenue share of the market during 2017 to 2026. On the basis of form, liquid soy protein concentrate is expected to exhibit a relatively faster expansion than dry soy protein concentrate through 2026, although the former will remain more lucrative than the latter. Transparency Market Research (TMR) has offered an exhaustive, and unbiased research report on the global soy protein concentrate market. The report delivers a detailed study of the global soy protein concentrate market, covering its key dynamics comprehensively, along with key trends impacting the market expansion. The report also offers an analysis on the market data around multiple parameters, for reaching at accurate market numbers. 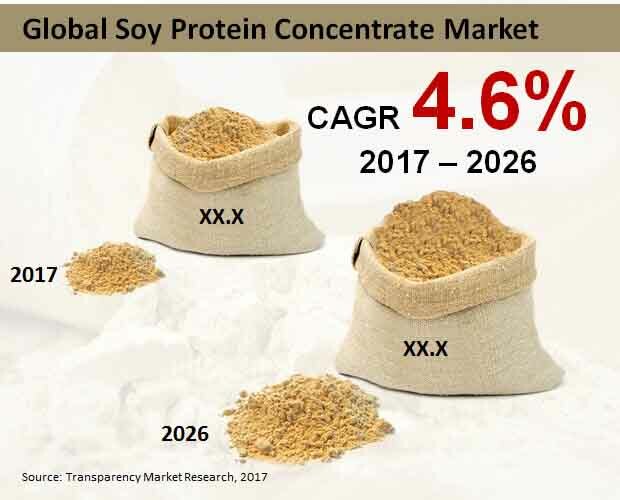 The competitive landscape of the global soy protein concentrate market has also been included in the report, which delivers information on key participants contributing to expansion of the market. The initial chapter of the report provides executive summary of the global soy protein concentrate market, followed by a market introduction and definition of the target product – soy protein concentrate. The executive summary delivers a 360-degree view of the market, while focusing on regional segments covered in the report. This chapter also offers the most relevant and significant market numbers, which include the historical CAGR for the years 2012 to 2016, and the forecast CAGR for the years 2017 to 2026. The executive summary also sheds light on profitable regions for the market expansion on the basis of highest CAGR, and largest revenues share. The introduction of global soy protein concentrate market allows report readers in understanding the market’s broad scope. The following chapter renders information on key dynamics influencing expansion of the global soy protein concentrate market. Key points covered in this chapter comprise the list of suppliers, and global economy. In its succeeding chapter, the report gives information associated with the cost structure analysis and pricing analysis of global soy protein concentrate market. Furthermore, the report has also offered analysis on the presence of key market players with the aid of an intensity map. The report has provided a segmentation-wise analysis & forecast of global soy protein concentrate market on the basis of form, applications, function, and region. This chapter includes imperative numbers pertaining to the market segments based on market share comparison, Y-o-Y growth comparison, and revenue comparison. On the basis of regions, the report has segmented global soy protein concentrate market into Asia-Pacific excluding Japan (APEJ), Europe, North America, Latin America, Middle East & Africa (MEA), and Japan. The concluding chapter of the report focuses on the global soy protein concentrate market’s competition landscape, delivering a detailed information on leading market players. This information about market participants is provided in the form of product overview, key financials, company overview, and key developments made by market players. The competition landscape also provides the SWOT (strengths, weaknesses, opportunities, and threats) analysis of the market players. The chapter on the market’s competition landscape is the most valuable part of the report, which contains every necessary information about market players for studying global leaders contributing to expansion of global market for soy protein concentrate. The competition landscape also offers analysis on how these companies are implementing their strategies, and their vision for acquiring a leading position in the market. The report on the global soy protein concentrate market is backed by a comprehensive research methodology, which depends upon both primary research and secondary research to gain all necessary information on the global soy protein concentrate market. Primary research forms the bulk of research efforts in addition to information garnered from telephonic interviews as well as interactions through e-mails. Secondary research includes analysis of company websites, stock analysis presentations, press releases, annual reports, and different national as well as international databases.